Tideman workboats built to last. Our unsinkable boats are set to revolutionise the day-to-day operations of maritime professions everywhere. The Tideman RBB (Rigid Buoyancy Boat) is a seriously tough workboat requiring zero maintenance. If only the Titanic was a Tideman. Boat building is nothing new to us, it’s in our blood, has been since the 1800s. But what has changed astronomically is how our boats are made, or rather, what our boats are made from. Forget wood and metals, they rot, rust, break and sink, our boats are made from an awesome indestructible plastic called HDPE. They’re indestructible: no damage in shallow rocky coasts and rivers; they’re extremely impact resistant – HDPE is so flexible they bounce off rocks like rubber. They’re super buoyancy makes them unsinkable. How? Because HDPE is lighter than water. They’ve got a major advantage over RIB boats: no vulnerable tubes and 50% more deck space. If all that wasn’t enough, Tideman boats have a flexible layout, are fool-proof to operate, and are safe when operating at high-speeds. 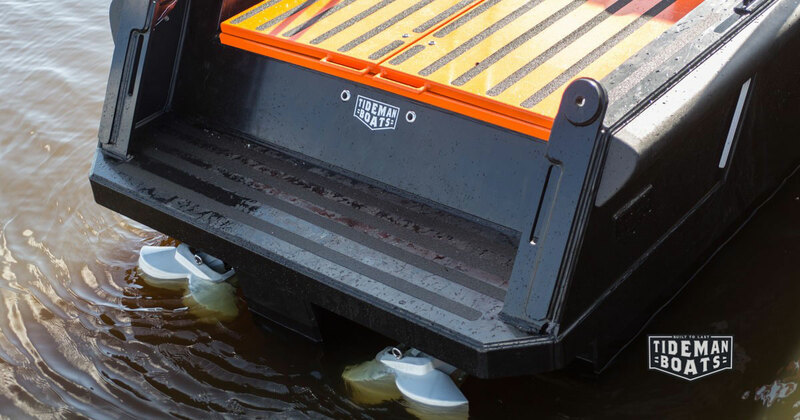 WHO WOULD BENEFIT FROM USING TIDEMAN WORKBOATS? Anyone needing a robust, rigid boat which can handle rough conditions will benefit from using a Tideman. Our single or twin-engined boats come in a choice of three sizes and can accommodate up to ten people. They’re indisructability should appeal to most industries, especially the Military. Dredging companies, divers, offshore workers, marine surveyors, fish farms, security and rescue services will all appreciate the durability and reliability of Tideman boats. If you need full use of the generous deck space to transport goods you can opt for a minimal layout. Or if you want a row of benches with waterproof storage underneath, that’s no problem. Our boats are completely versatile and can be styled to suit your business needs. We understand that it’s a lot to take in, and you’re probably going to want to see for yourself just how good our work boats really are. It would be our pleasure to have you here, and what a great excuse for a trip to Amsterdam! We’re confident you’ll like our boats so much that you’ll want to take one home with you. You already know they’re light, but you’ll also be glad to know they are easy to transport, they fit neatly into a standard-sized van. Whether you want to meet us in person, have a friendly chat over the phone or ask a question via email, we’d love to hear from you. For more inquiries, please send an e-mail to info@tidemanboats.com. We will get back to you as soon as possible.